Fray Pedro Font was the official chaplain and recorder for Captain Juan Bautista de Anza, leader of the 1775 Spanish military expedition from Sonora, Mexico. They traveled across the Southern California desert exploring new territory for Spain. Others traveled the Colorado desert and noted the area’s coquinas (limestone composed of shells and fragments) and the extensive arrays of invertebrate fossil deposits. However it was W.P. Blake’s detailed and comprehensive notes from 1853 which became the first official scientific records to influence the geologic and paleontologic history of Anza-Borrego Desert State Park. Blake concluded that the valley was originally occupied by seawater from the Gulf of California but further that the influx of fresh water from the Colorado River displaced the salt water and completely covered the valley in fresh water (Lake Cahuilla). From this, he also named the Colorado Desert, since the desert owed its origin to the Colorado River’s deposition of sediment and fresh water. Harley James Garbani had been discovering and recovering fossils since he was a child. He explored, surveyed and collected in the southern part of the Park. He found great success in the Vallecito Creek – Fish Creek Badlands. ​In 1954, Garbani eventually connected with Dr. Theodore Downs, the recently appointed Curator of the Natural History Museum of Los Angeles (LACM). Together they began the most productive phase of paleontological research in the region’s history. The mammal, bird and reptile fossils (approximately 6000) recovered by the LACM during the 1950s, ‘60s, and ‘70s were from more than 450 individual sites and numbered over 100 different species. In 1965, George Jacob Miller joined the LACM’s Anza-Borrego Team in 1965. 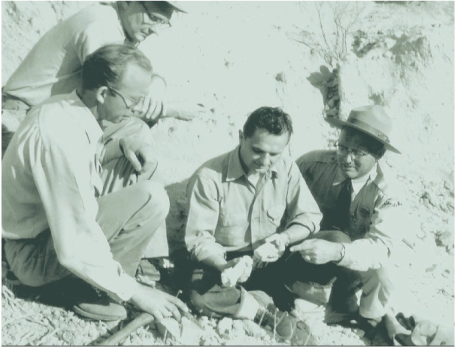 A career transfer in the early 1970s to Professor of Geology and Paleontology at the Imperial Valley College (IVCM) in Imperial, California, placed Miller in a position to discover and recover vertebrate fossils for a collection at the IVCM. 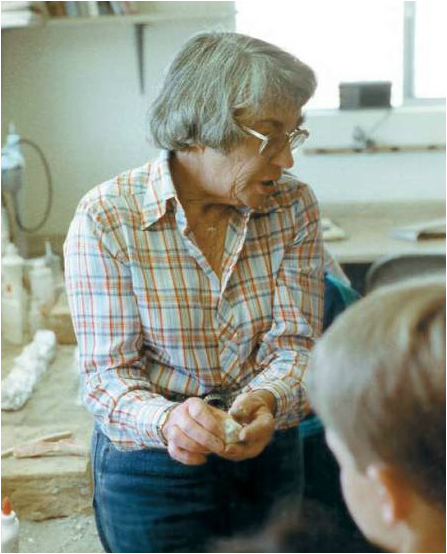 In 1974, after meeting Betty Stout, a knowledgeable volunteer aide and naturalist, and enlisting her help, Miller began teaching the first Paleontology classes in Borrego Springs. With these new, trained volunteers, Miller led the next big wave of productive paleontology surveying and collecting through the 1980s. With funds donated by Betty Stout and her husband, Charles, and under George Miller’s guidance, the first Stout Paleontology Laboratory was completed in 1982. The new laboratory gave the volunteers a facility for the preparation, repairing and curation of the majority of the fossils collected in the Park. Miller’s most acclaimed and publicized discovery occurred in December 1986. During the group’s last field trip that year, an area dense with bone shards and large bones was found. Ultimately that find would produce a mammoth skull, tusk and remains that is today the most complete skeleton of Mammoth meridionalis (southern mammoth) found in North America. In 1988 the “Miller Mammoth” skull and tusk were airlifted by helicopter and flown to the Stout laboratory. After Miller’s death in 1989, David Van Cleve, Colorado Desert District Superintendent, began to lay down the foundation for a permanent Park paleontology program. A Resource Management Plan and Collections Management Plan were written and approved, and in 1992 the IVCM collection was moved to the Park. The Park’s first State-sanctioned Certification Training Program in Paleontology was instituted. 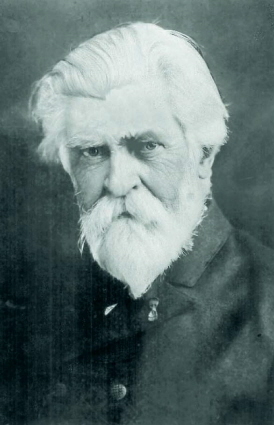 In January 1993, George T. Jefferson became the District’s first Paleontologist. Tackling the colossal project of organizing the botanic, invertebrate and vertebrate fossil collections into a professional working system, Jefferson was joined by Lyndon Murray as Collections Manager. That done, the task of transferring the Anza-Borrego collection from the Natural History Museum of Los Angeles to the Anza-Borrego Desert State Park (over 6000 items) was completed in 1997. The new Colorado Desert District Stout Research Center (built around the original Stout Laboratory) began in 1997 and was completed in 1998. At the Center’s dedication in 1999, it housed approximately 13,000 curated botanic, invertebrate, and vertebrate fossil specimens.